What is Trade-offs and Opportunity Cost? Trade-offs are choosing one thing over another, if you choose to invest in paint over pencils, your opportunity cost, is that you can no longer colour with pencils. This is a poor example, so lets look at some real data so we can get a good understanding of what opportunity cost is really about, and for that we need an example. A company, called Nails and Hammers LTD, produces hammers and nails, they have a good reputation, but are not really known, they also manufacture their hammers cheaply and therefore some of them are not exactly to the highest quality. in their first year, they only sell 100 units, this is barely enough sales to keep the business going, so they decide to invest in one of two strategies. Investing in Machinery, in order to produce better quality hammers, or Invest in Advertising, to get the word out about their Hammers and Nails. They decide that they will spend $300 dollars in the second year and see how it goes. They do their market research and come up with these two graphs. 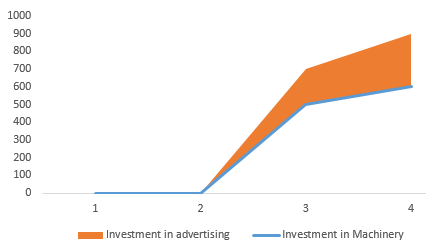 It can be seen from these graphs, that investment in advertisements will produce more sales than investment in machinery, therefore investment in Advertising is the way forward for Nails and Hammers LTD. This is called a trade-off, without the graph, it wouldn’t be known which is better for sales until the second year had ended. The same investment of $300 produced more sales. Lets, look at more data. Opportunity cost is essentially what you could have won if you had invested in something else, if you can only learn piano or tennis, and you choose piano, the opportunity cost is that you could have learnt tennis. Let’s take our previous example, and pretend that we invested in the lesser option, Machinery, we can see that we didn’t make as much as we would have if we had invested in Advertising. The opportunity cost in the third year would have been 200, because the investment in advertising, produced 700 sales, minus our 500 sales.